People Are Being So Mean to the "Fountain Lady"
Reckless texter Cathy Cruz Marrero fell into a shopping mall fountain while messaging her church buddy and achieved Internet fame. Now the media's ridiculing her for her criminal record and unresolved theft charges. She's our new Ted Williams! Like "Golden Voice," Marrero wasn't trying to become a national Internet sensation when she went viral. But she did become one, and she's received getting all kinds of press for her law-related stumbles—which really aren't that outrageous, but are making national headlines all the same. The Reading Eagle of Reading, Pa. reports that Marrero has a bunch of retail theft convictions on her record, and in 2009 was charged with identity theft in Berks County, Pa. (where the Gosselins are from!) after allegedly using her co-worker's credit card to buy more than $4,000 in pretty things from Zales. She also allegedly spent $1,000 at Target, but those charges were dropped. The Berks County charges remain unresolved; she's still going to court on those. Granted, Marrero kind of made herself look ridiculous by telling various national media sources that she was contemplating a lawsuit against the shopping mall for hiring insensitive security personnel. The reference to her "church friend"—the recipient of the text—was particularly rich, in light of the news about her past. But come on—she wasn't looking for any of this! She didn't want to be America's Next Top Role Model or a fancy commercial announcer—she was just minding her own business and got caught up in all this viral video spotlight stuff. Getting media attention, and the prospect of it, can make people say, do, and think ridiculous things—especially when they're not used to handling themselves in front of big TV cameras. Marrero was thrust into the spotlight without coaching or preparation, but with all of her flaws and shortcomings (and convictions) intact. Then she got a taste of attention, and apparently liked it enough to seek out a bit for herself. 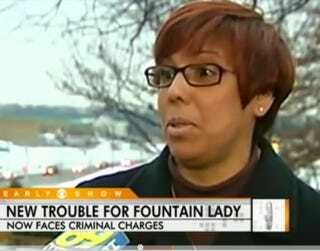 Unfortunately for her, she approached the media like she approached that fountain, and it backfired. Now she's paying the price. The blog Babble asks if we're all being as mean as those mall security personnel by laughing at Marrero. On one hand, no—we all get distracted and fall and bump into things, and it's better to laugh at these instances than harbor some sort of weird embarrassment or shame about them. (Marrero herself admits she's laughed about the video, when she wasn't crying.) But on the other hand, it is mean to make her out to be a pariah when there are many, many more people who are worthy of criticism on the national scale. This is not to say we should overlook or excuse her crimes—definitely not!—but for some media outlets to frame her foibles as though she's let us down seems like an overreaction.